Ready for an intense Pilates session? Try the megaformer at Body R&D in Lakeview. The details I’ve had trainers tell me about total muscle failure—the point where your arms or legs are shaking so much they could audition for a Jell-O Jigglers commercial—but I’ve never experienced it until now. I’m planking on a souped-up Pilates reformer machine known as the megaformer, praying that trainer Harry Shelley will lead us into the next move before my trembling arms collapse. At Lakeview fitness studio Body R&D, this is the norm: Whether Shelley has me pairing lunges with shoulder presses, eking out crunches or sitting in a V position spelling the alphabet with my legs (harder than it sounds), I’m working until the point of exhaustion. And I’m addicted. 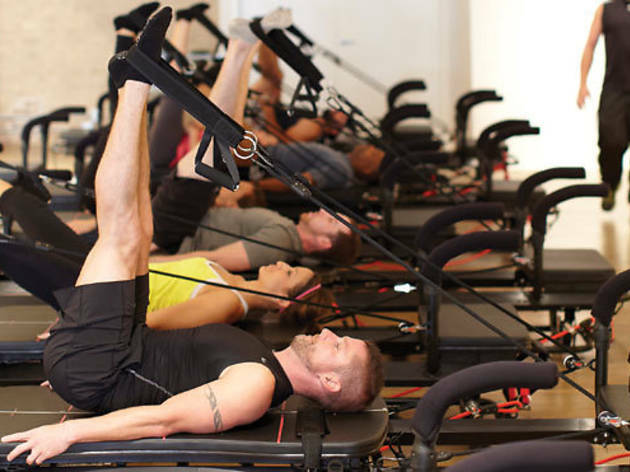 While I find Pilates slow and boring, the megaformer—a machine featuring two stable platforms connected by a moving, spring-loaded carriage, complete with straps, pulleys and handlebars dedicated to dozens of different moves—is the opposite, delivering a challenging total-body workout. I can feel my abs, legs and arms getting stronger as I fight against the resistance of the springs, and when I hook my foot into a bungee strap, kicking my leg to the ceiling against the tension of the rubber band, I’m working glute muscles I didn’t know I had. Shelley, an amiable former music video producer who plays an awesome soundtrack (everything from Tegan and Sara to the Foo Fighters) during every ten-person class, recently brought the workout to Chicago from L.A. He is encouraging of beginners—“just do what you can” is a favorite line—but as you get stronger, he’ll push you more, adamant that if you put in the effort, this workout will change your body. After less than a month of sessions, I can already tell he’s right. Rates are $30 for a single class, $220 for a ten-class pack and $199 per month for unlimited classes.